Put a pan of salted water on to boil. When it reaches boiling point add your dried spaghetti and cook according to the instructions to an al dente texture. When almost ready, place a large saute pan with a lid on a high heat and let it heat up. Roughly chop the parsley leaves and set aside. Peel and chop the garlic, halve the cherry tomatoes and have your wine ready. Coat the saute pan generously with extra virgin olive oil and add the garlic, some parsley (reserving some for garnishing the dish later) and a good pinch of salt and pepper. Add the finely sliced fresh chilli and the quartered cherry tomatoes. 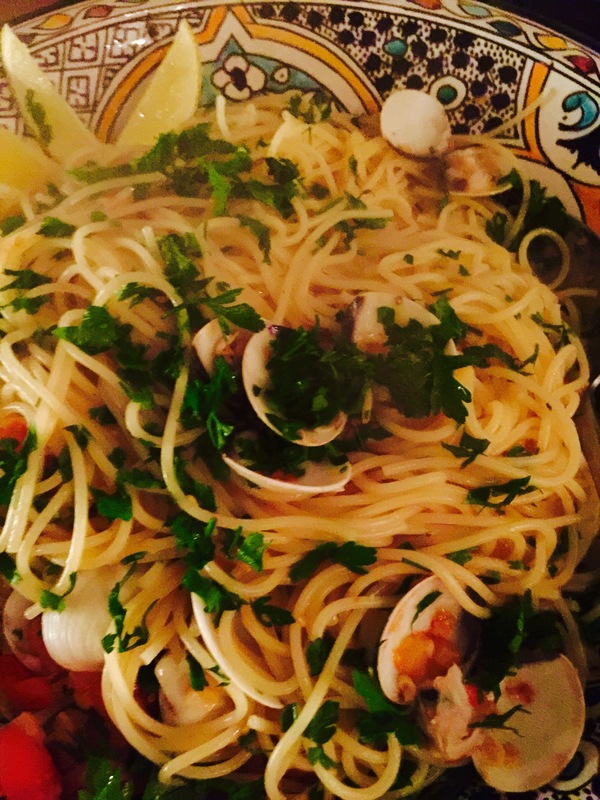 Stir everything around constantly and just as the garlic starts to colour, tip in the clams and pour in the wine. It will splutter and steam, so give everything a good shake and put the lid on the pan. After about 3 or 4 minutes the clams will start to open, so keep shuffling the pan around until all of them have opened. Take the pan off the heat. Get rid of any clams that haven’t opened, though I find with these frozen clams I have very few wasted clams! A delicious and speedy supper! 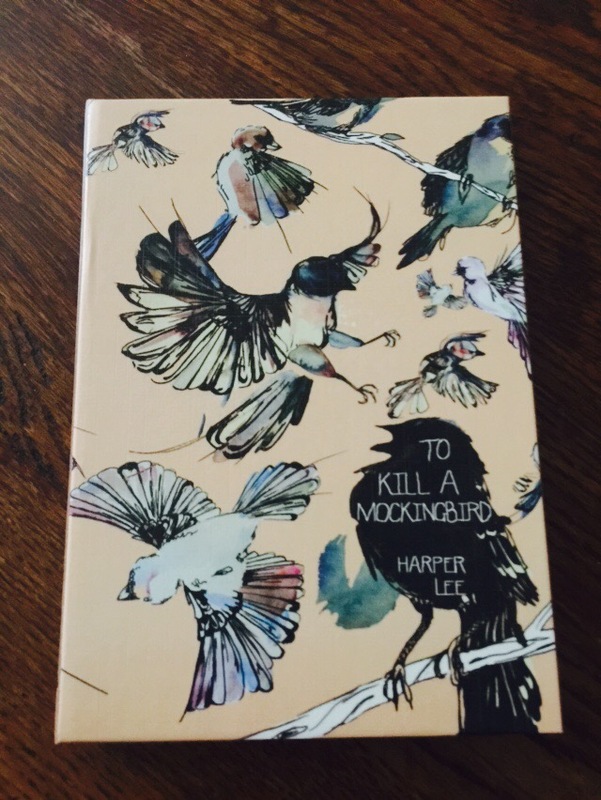 One of the loveliest and most thoughtful gifts I received for my FortyTen birthday was a Kindle cover by KleverCase in ‘To Kill A Mockingbird’ design. Those that read my blog regularly will know that this is my all-time favourite book and Atticus Finch is my all-time literary love! Founder of KleverCase, Philip Bradburn is a true Entrepreneur. After starting out as an apprentice bookbinder in 1976, his Eureka moment came with the advent of e-readers and specifically Amazon’s revolutionary Kindle. KleverCase was born out of his desire to keep old books alive and to produce high quality products using his experience and traditional skills as a bookbinder. You can read more of the history here. The company upholds true values for craftsmanship and heritage – and an outstanding customer service department (Mo could not have been more helpful. Loving your work Mo’!). Each KleverCase is made at Manor Bindery in the New Forest and each one comes with a personal signature of who made it … in my case Lotty – thanks Lotty! There are so many great gifts for book lovers available on the KleverCase website, even for those who won’t succumb to the Kindle (or any reading vehicle other than the printed tome!). Check out their leather bound box files that look like library greats to store receipts, bills etc. The designers obviously have a sense of humour! Impress on the beach with Eintsein’s Theory of Relativity or a Penguin Classic in their iconic orange. Not Another Trashy Novel brought a smile to my face too. There are diaries, notebooks, phone covers and other gift ideas for those who love the traditional or literary based gifts. I received the recipe for this delicious Carbonara from Edoardo at Enoteca Pitti Gola e Cantina (see the review of this fabulous Florentine Wine club here) – this is so far removed from the creamy gloop bought from the cold section in supermarkets and it takes only a fraction longer to cook the real thing than heating the pre-made stuff! No cream, no preservatives, no added sugar or thickeners just simple store cupboard ingredients! Cook pasta al dente, so about 1\2 minutes less than the instructions recommend. While pasta is cooking, heat a little bit of butter, the shallot and pancetta, when golden, (not burned), set aside in the pan. 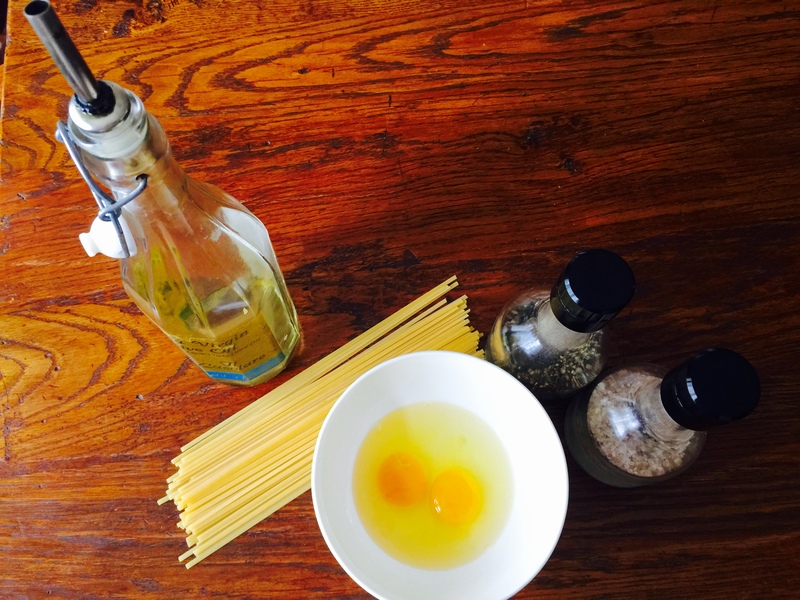 In a bowl put 1 egg p.p., some grated parmigiano, some salt, chopped parsley and black pepper and stir all together for 5 minutes with a fork. 1 minute before pasta is ready, put the pan on the heat again with the cooked pancetta and shallot. When the pasta is cooked, put it in the pan and stir for 30 seconds. Take off the heat, add the egg and about 2 tablespoons per person of pasta cooking water, some more parmesan and black pepper, and stir a lot, (approx 1 minute). If too ‘stiff’ , add some more of the pasta cooking water, if too soggy, keep on the heat for 10\15\20 seconds more until it becomes creamy again.